If the opossum is not already living in your yard, then fencing would be good for keeping them out. It could be a picket fence, electric fence or even a woven wire fence. If using an electric fence, remember there are enough currents going through it that whatever touches the fence they will get a sudden shock. If you have children or animals, then this might not be something you would want protecting the yard. If using a picket or woven wire fence, it needs to be at least four feet tall above the ground. To make sure the fence cannot be easily dug under, it is best to bury it a couple of inches under the ground. This will help keep unwanted critters from entering the backyard. Sometimes opossums will take up residency in the home, especially if there is an attic. The insulation makes perfect nesting material for the critters. They will also leave feces around in the attic while traveling around up there. This can start to put off a horrible stench over time. There is also the risk of an opossum getting trapped and dropping dead over time. If you are wondering how the opossum is able to get in the attic, they are very talented when it comes to climbing. Their tail is very strong and can wrap around things so that they do not fall. If an opossum is heading for the attic, it will more than likely be a female carrying her offspring. When spring is first moving in, take the time to check the house for any old siding that might be torn, odd holes, or even vents that have been gnawed through. Now is the best time to get these things fixed so that opossums, squirrels and even raccoons will stay out of the home. If you wait until there is damage, then you might have to replace the insulation and even ceilings, and this could be very costly. Motion lights are something every house should be equipped with. These lights turn on automatically when something passes by close enough to trip the light. Sometimes when the lights come on unexpectedly it could startle the opossum and it will run away. Over time, though, they could become accustomed to the lights so it will no longer startle them. There are also sprinklers that could be installed that work just like the lights. Once something gets too close, the sprinkler will kick on. Older opossums tend to take off more often when this type of system is in place. There are many different forms of repellants that can be used for discouraging opossums from coming into the yard. If you are looking for something that will not harm the yard, garden or even animals, then try a natural repellant. 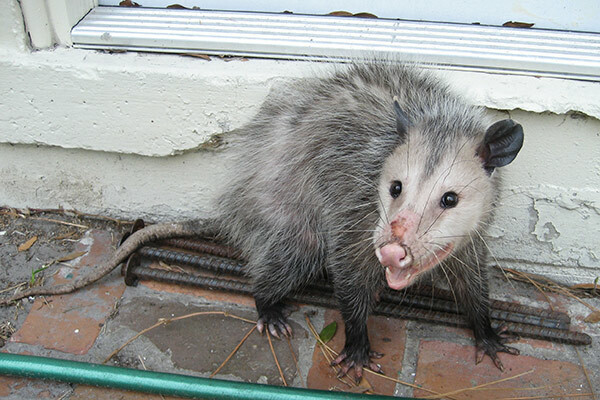 If you are growing items that have leaves, then the opossum might come up and munch on them. Mix together one liter of water and one cup of molasses with a dash of liquid soap used for cleaning the dishes. The opossums do not care for the taste so they will pass on munching and continue on their way. Always reapply after rain or every couple of days. Most states have laws in place so that you cannot legally set a trap in place that will kill the opossum. There are traps called live-holding though that are legal. This type of trap will allow you to place some food inside for luring the opossum in. Once they are inside the trap, the door will not let them back out. Now the animal can be safely removed and set free back in the wild away from your home. Keep the yard clean of clutter and trash. Wild animals are always on the hunt for food and if your yard has waste in it then it will attract many different types of wildlife whether you want them or not. This is the reason why you always want to put garbage in bags, firmly close the bags and then put them in garbage bins that have secured lids. This will prevent the garbage smell from getting out and also disable access to the garbage for these small thieves. Additionally, make sure that no pet bowls stay on the porch after pets have eaten. Opossums will gladly take advantage of pet food and water and will always return to the food and water source where they once found it. For this reason, either feed pets inside the house or instantly return pet bowls inside the house after pets eat. For more opossum prevention tips, go back to the How to Get Rid of Possums home page.